Titan Foam Parties organise and manage many of the biggest and best Foam Parties across the UK and Europe. Visit our ever expanding online photo gallery of people having wild fun at our Foam Party events across the UK and Europe. Titan Foam Parties have a range of foam machines and foam canons available for your Foam Party. If you would like more information about our Foam Party packages and prices then please contact us by phone - 07800 802 751 or email us. 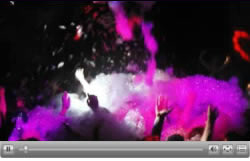 Titan Foam Parties are the Uk's leading Foam Party Hire Firm and Foam Party organisers. Established for more than 10 years we are experts in Foam parties and can organise a Foam Party at all types and sizes of venue due to the range of Foam Party Canons and Foam Generators we have available. If you are looking to organise an Ibiza style Foam Party then come to the Uk's biggest and best Foam Party Specialists - Titan Foam Parties. To enquire about our Foam Party services please call us on 07771 737 138 or email us more details about your Foam Party requirements. All images and content on this site are the sole property of Titan Foam Parties, all rights reserved.